December 2015 was a very slow season for IdentoGO as the population was focused on the holidays and competition was high for advertising space. As a result, the budget for December 2016 was decreased by 62.9%. Anvil was tasked with optimizing all campaigns and allotting the budget as needed to alleviate the seasonal decline as much as possible. Anvil monitored search, display, and social campaigns daily as CPA and conversion rates changed in order to maximize performance. A large emphasis was placed on search and the highest performing cities. Anvil surpassed the month’s projections despite spending over 62% less money. The December 2016 campaigns had the third-highest conversion rate in 18 months. 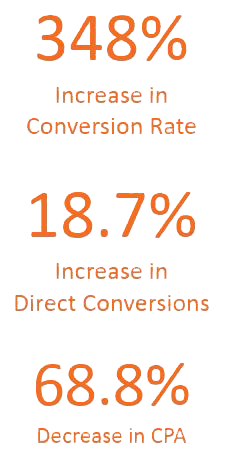 The paid social campaign pulled in the lowest CPA on any channel, while search had a 39% conversion rate.